Welcome back to Steam Greenlight showings from 2016 to 2017! 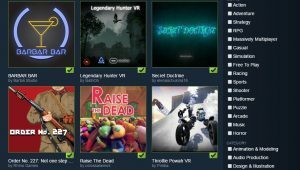 The previous trailers I found were part of the Greenlit section, meaning that they have gained a tremendous amount of support from the Steam community. As you can see, people have invented many creative approaches to gameplay. Once enough people “thumbs up” a game, it becomes Greenlit allowing people to leave their comments or ask the author questions about gameplay. So the next step is for Valve to contact the dev about getting it published, all that technical stuff. I do have to warn you, a lot of these titles require either a controller or a VR set. The next step would be for Valve to contact the dev about getting the game published in the Steam store. It is quite the venue for talented indie game designers to form a fanbase and possibly make a living with enough sales to start building their next project. See what’s in store on Greenlight now! Up to today, there are 14,655 games on Steam Greenlight and 16,665 games already released on Steam! We’re all gonna be here for the next 20 years playing them. Well, to be honest, a lot of garbage does pass through the filters. Trust your own judgment on this one. Here are 25 of my favorite game trailers from 2016 and onwards that have been already released on Steam! The title speaks for itself. Play as a bartender serving drinks in a galaxy far far away. You’ll meet some odd patrons from humans to monsters that belong to Amnesia while playing on the Oculus Rift with your VR touch controllers. I’m surprised they weren’t fired for dropping all those cups. It’s obviously a play on the word “judge.” You as a cybernetic judge, will make your own gavel gun and use mods that are able to boost your firepower or prevent you from accidentally hitting an innocent bystander. As an overhead shooter, the bright, colorful, bullets are a nice touch. As a face-paced action platformer, they certainly weren’t kidding about the challenging part! Your sprite will be targeted with speedy lasers, guns aimed at multiple angles, sudden explosions, and falling platforms. You’d better be at the top of your reflexes to beat all 10 game modes! You control an adorable fox made of polygons, about to go on an adventure in Arlandria to meet new friends and fulfill your destiny. Your fox will be collecting apples and strawberries while fighting undead totem poles and were-moles rats with antennas. Have you ever wanted to try hacking except without the fear of legal action being taken against you? Then, you could imitate the process of making a trojan virus, the bane of PC users all over the world. Set the infection method and add functions to increase its resistance to avoid being caught by central intelligence. Drones aren’t just for spying on people anymore. In High Voltage, you’ll be customizing drones and racing them against your friends on epic 3-D maps freestyling through parking lots, airports, empty malls, and even real-life DRL tracks! You must have a controller to pull off those sick moves. EMPORIUM is a horror game inspired by the mental psyche of an individual reliving the moments before an unknown tragedy. It is story-heavy, inducing feelings of bleak isolation. But, not much about the gameplay can be understood from just seeing the trailer. The Wall is certainly no stranger to immersive world-building as players are thrown into a virtual grid similar to the Matrix. They have to break through layers of digital walls without being spotted by the sentinels. It portrays the problems of internet censorship. I was pretty excited for this. Rifter utilizes a neon palette to stand above traditional platformers. Dash and swing into orbit as you listen to catchy synth wave beats. Use combos to destroy turrets, stalactite blocking your path and parkour your way past 50 levels! What do you think so far of the titles that were accepted on Greenlight? Read their store pages for further details. I am mainly a console gamer but I have to say these games look awesome! It is honestly hard for me to choose my favorite out of everything that I have seen. I really like the art style and soundtrack that Rifter had, Emporium seemed like an interesting story driven game, Jydge reminded me of an old arcade game that I played long ago, and I thought Arlandria looked beautiful. I would totally be interested in giving these games a try as they look really fun to tryout. I think it is also a cool idea to have fans vote for which games they want approved. Thanks for watching the videos, I only picked them out of the most recent Greenlight trailers that made a good first impression. Now I don’t know if they are playable or not, but I hope these get Greenlit before the whole operation shuts down. Next Next post: What exactly is Steam Early Access?